Pro audio on a JBL Charge 2+ speaker? I am always hassling people to supply me speakers and amps here and there, but at last at my temporary home or hotel i have nothing but a pair of Sennheiser HD650 to trust in. Those headphones are LOVELY, but they are still headphones. No body sound experience in there. 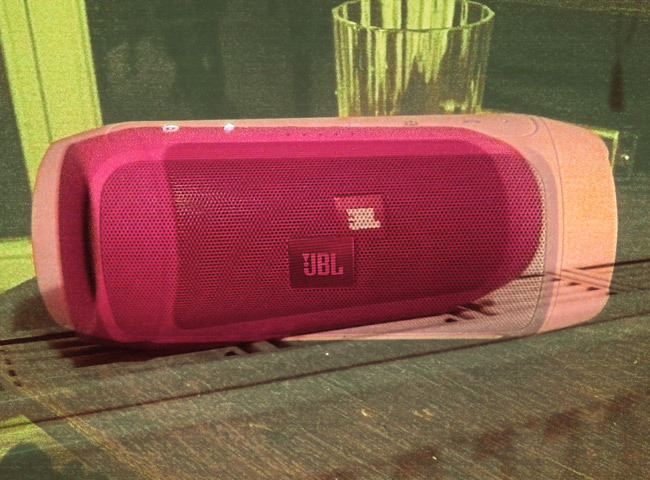 Recently i ran into a JBL Charge 2+ Bluetooth speaker, which now travels with me. So just let me introduce what i found to you. This enticingly small (8×8×19 cms) stereo speaker by JBL has the usual psychoacoustic simulation of “bass” going (75 Hz – 20 kHz/nothing great, but adaptable). This device is actually made by HARMAN International Industries, which is only a problem, when you try to register your product online. Because you’ll get a 404 by .. Infinity Speakers, which is yet more absurd. You’ll feel kind of lost. However, there’s a printed quick guide within the package. Unfortunately the letters are very small and i had to go to a convenience store to get even tougher reading glasses. No fun. We’ll there’s a pdf on the JBL website. Got downloaded. But is the same! On my Mac with stable 10.7.5 since 4 years i just paired the thing over Bluetooth and hoped for the best. - easy to carry around, just make sure you cover the 1.75” membranes at either end not to damage them. I just use an old t-shirt wrapped around. - sounds more rocking than those Bose thingies at half the price – but see CONS below. - battery lasts quite some time – they say at least 4 hours, or up to 10. 4 at almost full volume when it’s new, i’d say. - despite a “workable” sound – there is no REAL bass. What’s there at 80-120Hz is 3-10 dB to loud in order to compensate for the missing sub bass. Plus there isn’t much real pushing or pulling frequencies, as a kind of multiband compression seems to turn any sound to the same anyways. So beware, when mixing, even if Bose speakers seem much worse! - BIG AUDIO DELAY on Bluetooth connection (approx 0.5-0.7 seconds!) – the visible position of your DAW will always be way ahead. Workaround: Use a mini headphone cable to connect instead. - no proper manual anywhere. There’s a quick start guide (even online). - high frequencies above 10k seem missing (despite them saying 75 Hz – 20 kHz). Will have to technically reconfirm with a measurement mic session. - Bluetooth connection only stable after boot. Switch the Charge 2+ off or change your audio driver and you’ll need a restart to reliably establish a new connection to the Charge 2+. If ever there are few or many other Bluetooth devices (usually smart phones) in the room, they will try to connect to the JBL, too. The Charge 2+ gets confused then, even if you paired it to your mac before. Not content with that workaround: Use a mini headphone cable to connect instead. Hope it helps. Let me know, what you found.